"This is scary," Petula Clark said, eyeing the mound of records and CDs at her feet. "It's scary for me, too," said the fan, who had wanted to prove his authenticity by displaying 34 years of Pet collecting. "You put someone up on a pedestal, and then maybe they end up just being human? The fan, in this case, is also a journalist, this journalist in fact, who usually believes in a professional distance. But ever since 1965, when Downtown became a hit, I have had a thing for Petula Clark's music. It's never been particularly hip, but I didn't care. It made me happy. "You haven't really listened to all these?" Clark said, still a bit stunned. "How brave of you. It's more than I would do. I don't have half these things. The Albert Hall one over there, does that have the Hair medley on it? Some of that stuff is quite good." For many people, Petula Clark is just a name from the `60s, a perky singer with a string of feel-good hits. But before Downtown, Clark had been a child star in England during the war, and then, as a young adult, one of the most popular singers in England. And while the radio hits and major-label record deals are long past, and a Hollywood career flickered out after only two movies, Clark has continued to record and perform while raising her three now grown children. But it's been the musical theater that has provided Clark, now 66 with her highest profile in later years. In the early '80s and cast to type, Clark starred as Maria von Trapp in a major London revival of The Sound of Music. In 1990, she composed as well as starred in the West End musical Someone Like You. More recently, she helped resurrect the faltering Blood Brothers on Broadway and then on tour, playing a blue collar single mother carrying a tragic secret. But the biggest stretch came in 1995 when she took over the starring role in the London production of Sunset Boulevard, playing that legendary gorgon Norma Desmond for more than a year. After an earlier US tour collapsed under the weight of its elaborate set, Clark was paged to give star power to a downsized production now at the Curran Theatre. "You might be disappointed that the decor doesn't have all the tra la-la," Clark said recently in Sacramento, a previous stop on the Sunset tour. "I worked on that set in London, and I know the effect it had on the audience. But Susan Schulman, who redirected it, wanted the show to be more about the people anyway, apart from the fact that logistically the other set didn't work?" When original director Trevor Nunn asked Clark to take over the London production, she was more mystified than flattered. "I said right from the start, I don't believe I'm right for this," Clark said. Even after she was convinced to play the role that Gloria Swanson had created in Billy Wilder's classic 1950 film, she was still struggling as rehearsals began. "I was confused, and I didn't know quite what I was doing with it,'" she said. "Halfway through rehearsals, I asked Trevor what he thought I could bring to the role. He said, 'Humor and vulnerability.' I think he was absolutely right." 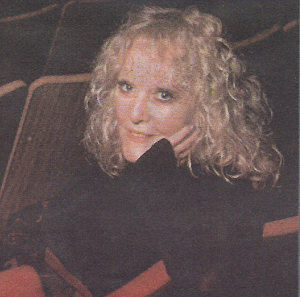 Clark wasn't too taken with the show when she saw first saw Glenn Close as the reclusive former silent movie star, but warmed up to it considerably after seeing her London predecessor Elaine Paige in the role. "I liked Elaine because it was rather like seeing Gloria Swanson with music," Clark said. "Then I discovered that she had been told by Trevor to see the film as often as possible, and she told me that she had seen it 40 times." On the other hand, looking for a different approach, Nunn instructed Clark not to see the movie. "But my son tricked me into seeing it one evening in London after I had been playing it for a year. I found myself say, `No, that's not it, no, no' and this to Gloria Swanson, who created it." Sunset Boulevard is a great movie, but Swansons' performance has become a camp classic, and most of the musical's Normas have preserved that over the-top diva charactization. "But I'm not that kind of performer," Clark said, and I wonder sometimes if some of the gay community isn't disappointed in me for that. I want to play her for real. It's the only way I know how to do it." Andrew Lloyd Webber, the musical's superstar composer, has seen the new version of Sunset Boulevard and Clark reports that he loves it. There has been some talk about a return to London with this version, but if it happens, it won't be with Clark. "I think I'm Norma'd out," she said. 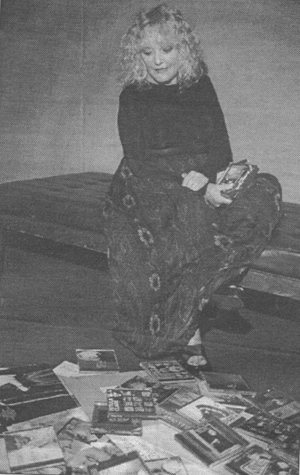 Petula Clark contemplates a fan's collection. Clark du Soleil? After she completes her Sunset commitment, Clark has plans for a theatrical retrospective of her life and career. A director from Cirque du Soleil has been working with her, suggesting it will be more than just an and- then-I- sang compendium. "I'm not going to be swinging by my ankles singing Downtown," she said, "but you never know." Clark can still remember the moment she first heard the song that forever changed her life and career. In the early `60s, she was living and working in Paris (she's been married to Frenchman Claude Wolff for 38 years), and had effectively ahandoned her English speaking career. It was the beginning a legendary collaboration, producing a string of hits that included I Know a Place, Don't Sleep in the Subway, A Sign of the Times, My Love, I Couldn't Live Without Your Love, The Other's Man Grass, and Color My World. For Clark, whose earlier English recordings had been musically thin, Hatch provided her with a rich, new sound. "It had been what I had been wanting to do, and didn't know how to do it," she said. "It just kind of liberated me, which I suppose really was what the `60s were about." Downtown introduced Clark in the United States, and it wasn't long before Hollywood came calling. Unfortunately, neither Finian's Rainbow with Fred Astaire nor Goodbye, Mr. Chips with Peter O'Toole was a box-office success, and there have been no movies since. "I've been asked to do a movie," Clark said. "It's a fantastic role, but I'm not sure how good the movie is going to be. It depends on who the director is." Her first Hollywood director was Francis Ford Coppola, who made his screen debut with Finian's Rainbow. "I loved him from the first moment I met him," Clark said. "But it was not an easy movie to make. We were on the back lot at Warner Bros. in the steaming heat, and we were like a band of gypsies back then. And Jack Warner didn't want to know much about us. You know, a bunch of hippies smoking pot, and motorbikes and flower power and stuff like that." It may be hard to imagine Petula Clark in league with dope smoking hippies, so quickly and firmly was her image cast. There were the uptempo think-positive songs, her ladylike looks and demeanor, and of course, that whimsical name her father had made up. "There are lots of cows and barges named Petula, and actually now there is a shoe called the Petula made by Mephisto" she said. "It's a very nice shoe, not tacky at all." But despite a career that has spanned six decades, an indelible musical legacy, and even a shoe named for her, Clark sometimes ponders what might have been. "I've often thought how nice it would be to change my name and change my hair and try again to see if it worked," she said. "Just try singing something else, like with a really outrageous rock hand and see what that feels like." And for some reason, with the interview winding down, I said to Petula Clark, "You go, girl." She did a double take, and then smiled. And then she left. With my duffel bag of albums, including a newly autographed copy of the original Downtown LP, I headed home. Smiling.